← Relationship: Just Let Me Be Myself! I have found people who are strong are often misunderstood. We simply handle things from a different perspective. It is not that we are never hit with the blows of life, we just don’t buckle. We don’t wallow in the pains of life. The weak cowers to life’s situations. Strength sees another way around the problem. Whereas others accept the problem and only hope for a better day— strength works to make it a better day. During a crisis, we dig deep within and pull out the power of self. We then begin to strategize with a tangible resource around us, considering what that resource could provide and how we can provide a resource to that resource. We know that life is not always about taking from others. We recognize the win-win of the giving and receiving cycle. Those who have emotional insecurity often do not mix well with our energy, because we have little tolerance for a pity party, stupidity, idle mindedness, loose lip chatter, or negativity. While the weak fears to stand on their own to find a way, we do not always know the way; we just know there is a better way. In order to find the way, we learn through the powers of those before us, our historical ancestors, our experiences, the universal powers, and the God we believe in. These are all teachers and givers of strength. We draw from these sources. Just because we do not seek to justify ourselves in order to win validation of others, we are often misjudged. We know the truth, but we press forward, refusing to crumble in being misunderstood. We use negative situations as a step stool to gain more knowledge, power and truth. The weak has a need to prove something, while the strong holds its own, needing to prove nothing. The results of having a strong character, authenticity, a winning spirit, and a good heart are all proof enough. Truth does not cry out begging to be understood, but it is there for all who inquires. Weakness has a problem dealing with issues directly and objectively, but strength has no problem fighting for the cause or maintaining a position by which all logic, objectivity and reason supports. Strength directly handles conflict with objectivity and perseverance until the resolve is done. The weak perceives this behavior as confrontational. When the strong is wrong, we acknowledge such wrongs. The words, “I am sorry” is not hard for us. We know that if we do not say the words with sincerity, this diminishes our character. It is not a risk we are willing to take. Weakness is not about the inability to do. Weakness is only the unwillingness to try. Weakness is not about the inability to be strong; it is only about the lack of choice to be strong. When it comes to problems, the weak only lacks the effort to try to solve them. The strong never stops until the solution is won. People look at strength as a big to-do. It really isn’t. It is about having the chutzpah to not accept anything less than the quality of a wholistic life that we work to achieve, along with the work we put in to be our best self and willingly give to others. It is not about our expectations of others, because there is no need to control anyone. There is no challenge in that. I often hear some Christians say that God is still working with them. If we do not do the self work, no God can do it for us. No matter what God we believe in, God only works with whatever measure of strength we have. If you have little strength, God can only produce little work. If you produce much strength, God can produce much work in your life. Your strength works the same as your faith. Little faith renders little, if anything at all. Finally, strength has the ability to identify its own weaknesses. The strong makes the choice to strengthen each weakness, while moving forward in life, and will sometimes take a verbal, even reputational punch, only if punching back minimizes or removes their self power. The strong has no choice but to rise in times of trouble, because the alternative is the depths of pity without productivity— only captivity into emotional self destruction and perpetual weakness. 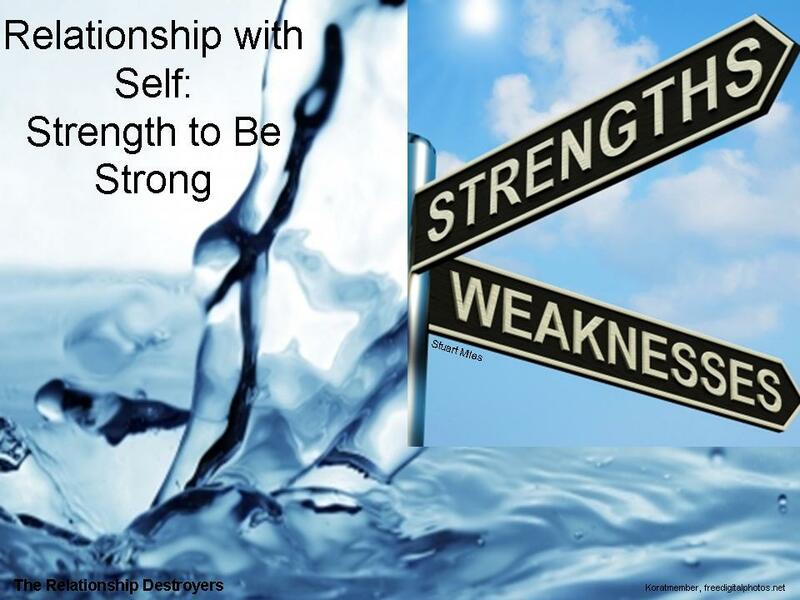 This entry was posted in Self and tagged being strong while misunderstood, inner strength, refusing to be weak, the strong is misunderstood, the ways in which strong people are, the weak and the strong. Bookmark the permalink.